Noticed recently that Ash had started to grasp objects and learnt the concept of cause and effect. Nope, not the buddhist teaching of cause and effect but rather that for every action, there is a reaction. 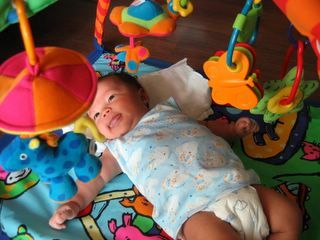 He has started to hit at his toys and he loves looking at them when they move.